Pictured is Cathy Massie White, Nathaniel Massie is an ancestral cousin to Cathy, and Nathaniel Massie, portrayed by David Tillis. Members and their guests of Fayette County Genealogical Society were sitting in their chairs in the meeting room at Carnegie Library in Washington Court House when Nathaniel Massie (1763-1812) walks in. Suddenly, it is 1795 and Nathaniel, a Revolutionary War veteran, begins the story of the last battle between the whites and the Indians in Ross County before the ratification of the Treaty of Greenville later that same year. Nathaniel and a group of men who would be future settlers to the area were part of that battle. Nathaniel told how he founded Chillicothe in 1796 and then Bainbridge in 1805, where his ancestral home still stands today. Nathaniel, who became a surveyor of lands given to Revolutionary veterans for payment for their service in the revolution, was instrumental in opening up the Northwest Territory, especially Ohio, to settlement. He was very influential in pushing the issue of Ohio becoming a state and served in the Ohio legislature after Ohio became a state in 1803. 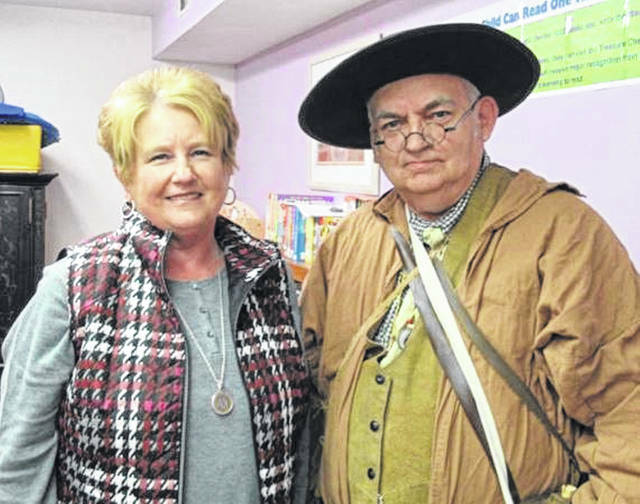 David Tillis, a southern Ohio historian and a resident of Bainbridge, portrayed Nathaniel Massie in authentic costume for the society. David is the president of the Bainbridge Historical Society, volunteers as a docent at the Dr. John Harris Dental Museum in Bainbridge, the first dental school in the United States, and serves as president of the Friends of Lucy, an organization dedicated to promoting and preserving the legacy of Lucy Ware Webb Hayes, the wife of Rutherford B. Hayes, the 19th President. Lucy was born in Chillicothe. David Tillis hold degrees from Asbury College, Lincoln Christian Seminary, the Institute of Holy Land Studies in Jerusalem, and Israel and Hebrew Union College in Cincinnati. He has participated in several archaeological digs in northern Kentucky and southwest Ohio. The next meeting of the Fayette County Genealogical Society will be the annual holiday dinner held Monday, Dec. 17 at the Pinkerton House, 605 S. North St. in Washington Court House, for members and their guests, catered by Jason Gilmore. The cost is $15 per person with the social hour beginning at 6:30 p.m. and being served at 7 p.m. Reservations should be made by Wednesday, Dec. 12 by emailing Sue Gilmore at suegilmore@yahoo.com or calling her at 614-864-9609. Anyone needing any further information concerning the society, membership or future meetings may contact Sue or Cathy Massie White at RenionMassie@yahoo.com or 740-333-7227.
https://www.recordherald.com/wp-content/uploads/sites/27/2018/12/web1_GenealogicalSociety.jpgPictured is Cathy Massie White, Nathaniel Massie is an ancestral cousin to Cathy, and Nathaniel Massie, portrayed by David Tillis.